Dredging has been a hugely contentious issue in the UK ever since the St Jude’s storm hit the country on the 28 October 2013; this marked the beginning of a relentless winter weather pattern of heavy rainfall and high winds. This severe weather coupled with coastal surges breaching flood defences led to large parts of the UK to be under water – a situation that still exists for significant parts of Somerset. Satellite data was used to map the flooded areas as part of the flood response by UK government agencies; more details can be found in our post Is the Southern UK Flooding a Disaster? As the flooding occurred local communities bemoaned the lack of river dredging in recent times, and they felt this was a significant contributing factor for the rising water levels. In Prime Minister’s Questions on the 29th January this year, David Cameron announced that once flood waters in Somerset had drained away, rivers in the county will be dredged. Dredging itself also creates problems, releasing suspended sediment into the river water and secondly the need to get rid of the dredged material. Image of East Devon, UK taken by Landsat 8 on 4th November 2013. The River Exe flows from top to bottom and the River Teign from left to right. Plumes of suspended sediment are clearly visible following periods of heavy rainfall in late October and early November 2013. In addition to flood mapping, satellite data can also be used to map and monitor sediment transported. 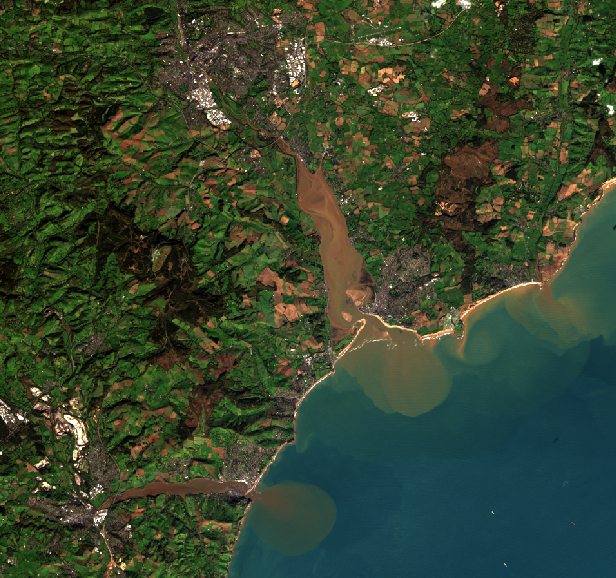 The Landsat 8 image on the right shows the plumes of sediment visible around the east Devon coastline just one week after the St. Jude’s storm. Since 1972 the Landsat mission has continuously monitoring the Earth’s surface; and makes this information freely accessible for use across a range of sectors. This week it was announced that dredging of the River Tamar, on the border between Devon and Cornwall, will continue for the next two years in order to keep the channels clear for access to Devonport Dockyard. The silt from this process will be deposited in Whitsand Bay, Cornwall, despite the area being designated as a Marine Conservation Zone. Dredging is a tool coming back into the UK flood defence armoury; the benefits, and potential harm, will be monitored closely in the coming months and years. Next week’s we’ll be looking at the accelerated coastal erosion from the winter storms. 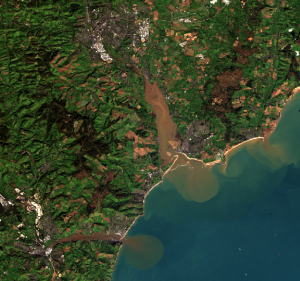 This entry was posted in Earth Observation, Landsat, Space Can Help, Uncategorized, Understanding Space, visualisation and tagged Devon, dredging, Flooding, Landsat 8, satellite, Sediment, silt, St Jude’s storm, Suspended Sediment, Tamar by Andy. Bookmark the permalink.